I’ve been knitting socks for a while now. I learned in 2008, right after I purchased the yarn shop. I didn’t like it at first. I thought it was fiddly, especially the picking up of stitches for the gusset and doing the gusset and it took a loooooong time to knit one. Never mind two, which you need in order to wear them. My favorite to look at are the watermelon socks, but my favorite to wear are the two pairs on the bottom. The yarn is the softest and they are the most comfortable because they are the most basic (no lace or beads). However. It is tedious. And I have a lot of socks. And I knit a lot of socks. 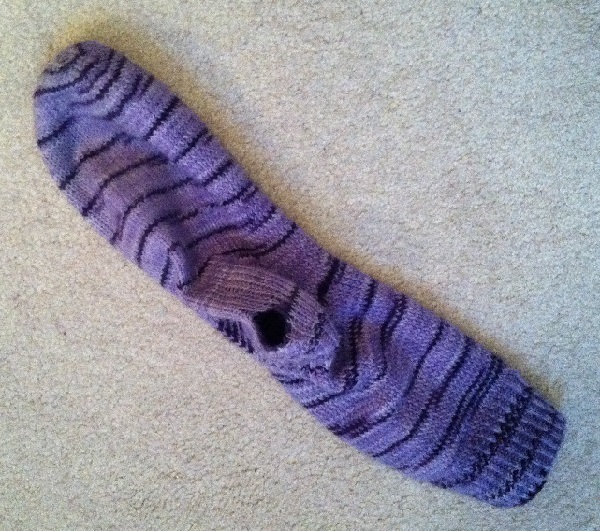 And now I have several pairs that I’ve had for several years and this will not be the last sock that gets a hole in it. 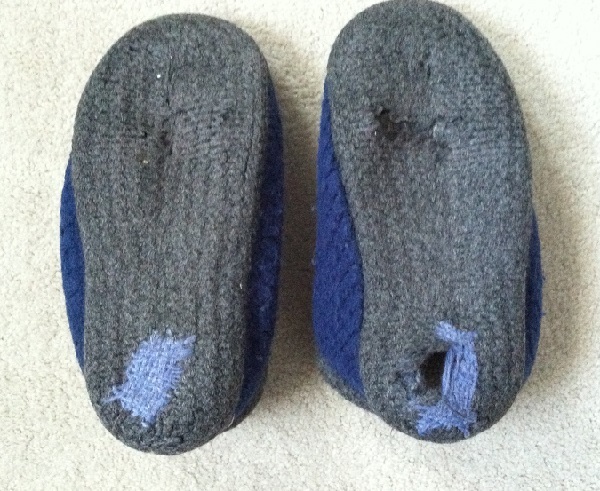 And I have a lot of other knitting to do, so taking time to darn the holes in said socks is a pain. 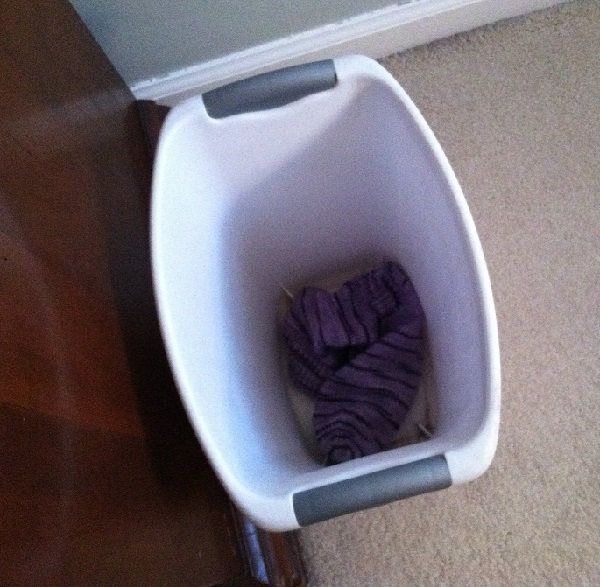 Hold them over the garbage can, proclaim loudly, “Darn it!” and release. I’m sure there are some gasps out there. How could I just throw them away? What about the other one? Those are handmade!! I look at it this way: I have so much sock yarn in my stash (SO. MUCH.) that I will never run out of yarn to knit socks with. And I will keep knitting socks and there is only so much room in my dresser to hold said socks, and I’ve clearly loved a hole right into these socks, so IT’S OKAY. Really. It is. Posted in Uncategorized and tagged darn it, socks on March 27, 2015 by lizytish. Love the yarn Harlot’s method of darning, darn it! Still on my very first set of socks, but will have to remember this when the same thing happens to me eventually! Thanks for sharing. Hmmm, haven’t tried that darning method yet. The first to go are always my favorites cuz I wear them so much. 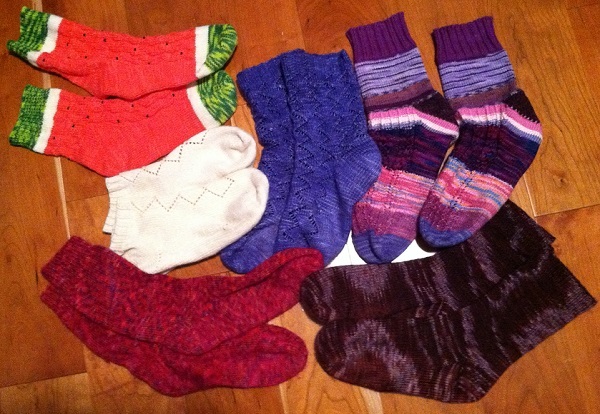 The bigger problem is that my sock drawer overfloweth yet I still keep knitting socks. So much pretty sock yarn out there! Let alone already in my stash. What’s a knitter to do?!? Agreed! Just keep knitting – we can always use it for insulation! I didn’t expect that punch line! I did gasp. Out loud. I heard that gasp from over here!